Joseph LaVernie Watson (August 19, 1925 – November 2, 2006) was an American football player who played one season with the Detroit Lions of the National Football League. 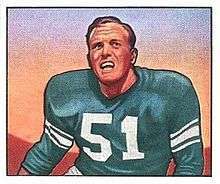 He was drafted by the Detroit Lions with the fifth overall pick of the 1950 NFL Draft. He played college football at Rice University. ↑ "JOE WATSON". profootballarchives.com. Retrieved September 18, 2014.